Yea! Back to school! I always loved this time of year as a kid. By the time August came each year summer had long been boring and I was ready to see friends again. And the best part, we got to buy new school clothes. That probably sounds totally silly, but choosing a new outfit from our new wardrobe for the first day of school was one of the most exciting parts. Yes, it’s going to be a good year. I promised a while back that I would post our homeschool schedule. So, if anyone is interested, here is our fall schedule. And if you can decipher my craziness, you’re good. Real good. It took me a while to figure it out myself! This is the second homeschool schedule I’ve made; the first was for the spring. It is a definite process. First, I spend hours getting everything to line up, making sure to mix up independent work with dependent work. If I put too many dependent things in the same slot, everyone gets short changed. Next step, I implement it and find out very quickly what works and what doesn’t. (For example, having all the kids do language at the same time was a disaster. Had to switch that around.) Then, after 2 or 3 weeks of testing and tweaking I feel comfortable enough to use precious paper and toner and print the hard copy. We just completed our 3rd week and I’m feeling pretty good about it. So good that I printed it on Friday. One of the things I’m most excited about this year are the two new things we’ve squeezed into the schedule. I’ve found that if it’s not on the schedule, it doesn’t usually happen. For this reason we have piano practice and exercise in their very own time slots for each of the kids. And so far, they’re both happening! Yea! And no, that’s no typo. The kids will be exercising 3 times a day this year. More about piano and exercise will have to wait for another post. (If anyone is wondering, “zhong wen” means “Chinese” in Chinese. :)) We have started our new homeschool year! I wanted to give a little update on our progress with the language so far. I think it will be fun to compare this entry with an entry at the end of the year to see the progress we’ve made. Our kids are now in 5th, 4th, 2nd, 2nd and kindergarten. Hard to believe! One year ago our children spoke very little Chinese. They each had a vocabulary of probably 20 words or less. When we brought Jasmine home we all learned a bit of Chinese from her. We also had the older two kids start studying a bit more since we knew we’d be moving to China. 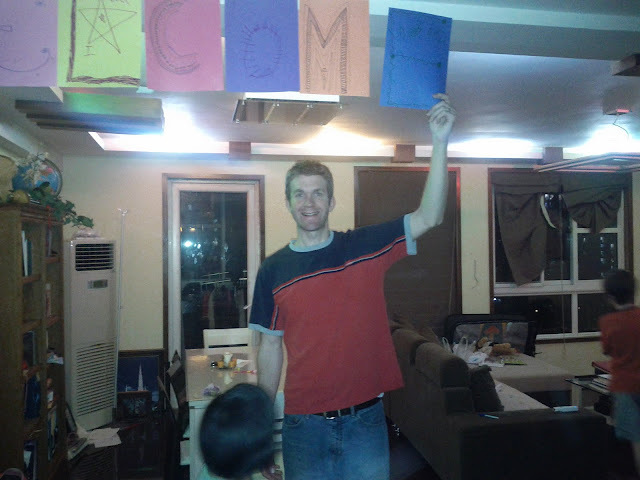 Seven months ago we moved to Beijing. At that point our 2 oldest children had vocabularies of 100-200 words and could speak a few basic sentences. The 2 youngest boys knew fewer than 50 words. None of the children (except Jasmine) could read more than 10-15 Chinese characters. And they couldn’t write any of those characters. As part of our homeschool we have a Chinese tutor come to our house 4 days a week, 3 hours a day. The oldest 2 now have some basic functional fluency. Yea! Kaylee Ann’s Chinese has really taken off. I think it’s because she and her Mandarin speaking sister spend so much time together. Having Chinese friends here has also helped. It’s fun to hear her speak with her friends when they come over! 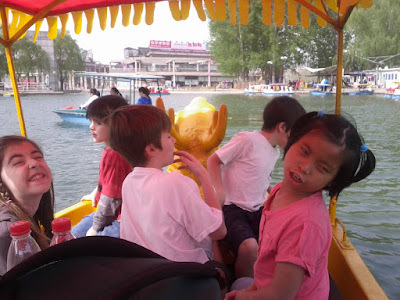 She also organizes games at the park–in Chinese–with all the kids. I’m so glad she’s gotten over some of her shyness when it comes to speaking Chinese. 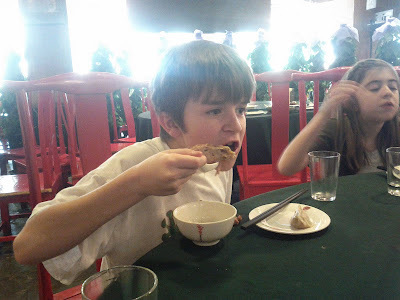 Michael also knows quite a bit of Chinese, can read and write a little more than Kaylee Ann, but isn’t as comfortable speaking yet because he’s a little shy making friends with the Chinese boys in the neighborhood. I think if he can make a few Chinese friends this year it will help a lot. Trevin reminds me everyday that he doesn’t want to learn Chinese. Luckily he is such an obedient boy that he studies anyway. He has very basic conversational skills, can talk about his family, his age and birthday, likes and dislikes, etc. He is also learning reading and writing and diligently write his characters every day. As I was about to finish this post, I realized something. We visited the U.S. for the entire month of July. And I realized that our two girls stopped speaking Chinese to each other at that point. We will probably need to begin speaking Chinese with all the kids at home if we want them to really become fluent. We’ll have to give that a shot. Only problem is, that means I’m going to have to speak Chinese too! Wish us luck! It all started when Jasmine got a game out tonight and asked if we could play. I was about to make some cookies (yummy) but told her I’d be happy to join in once I got them in the oven (toaster oven). She then went and asked Michael if he’d play, and Michael just jumped right in and said yes … the game started with Michael and Jasmine and Trevin, while Kaylee Ann and Spencer helped me out in the kitchen with the cookies. Jill was happily playing some wonderful background music on her new piano. This combination of playing games, cookie making, and music playing created what can only be described as the perfect environment for something spontaneous and fun to occur… and that it did. “Never say never.” (That’s just me giving myself some good advice, that I will most likely forget—again.) And now I will remind myself why I should “never say never” by listing only a few of the times I’ve said it, only to have it come back and bite me in the buttocks. After living in Albuquerque for 6 years and planning my children’s education for the next 8 years, I knew I never wanted to move from there, at least not until the kids were through middle school. “I would go insane!” “I’m not organized enough.” “Homeschooled kids are weird!” And I’ve given a hundred other reasons I would “never” homeschool. But here I am, married to a Giles, with an odd number of kids, all of whom have thrown tantrums, moved from Arizona and Albuquerque to China of all places, and…I’m homeschooling. When we made the decision to homeschool the kids I knew it was what I was supposed to do, but Todd and I were apprehensive nonetheless. Todd worried about my sanity. I worried about my sanity, a little, but I worried more about the kids. What if I failed them in their education? My first goal for myself was survival. (I set the bar a little low, I know.) And if the kids learned something and didn’t despise me at the end of the day, that would be progress. And if the kids learned a lot and actually liked it, that would be a tremendous success! We just finished our second month of homeschool, and it has been a success!!! The kids are loving it. That doesn’t mean they love every single thing they have to do, or that every day is perfect, but as far as an overall school experience goes, they have told me they like it much better than regular school. And something I never imagined possible, I love it too! I may even love it more than the kids do. We can always start the day off right with prayer and scripture study, even if we’re running late. The kids are learning more. They’re learning at their own pace (some need it faster, some need it slower). I can teach them what I feel is most important and timely. I feel like their education is more well rounded than it was in any of their previous schools. We make the schedule and can take trips, vacations, and holidays without interfering with school. I spend more time with my children, and enjoy that time more. I know exactly what the kids are learning, what their assignments are, and what the requirements are for the assignments. No more guesswork. The stress levels in our home have actually decreased. I get to learn new things every day. I still can’t get over the fact that I’m homeschooling and loving it! I am one happy homeschooling mom. I have so much more I want to say, but this post is waxing long. Obviously I’m new to homeschooling, but I would love to share our experiences if it might help other families out there. I already have a few ideas for future homeschool posts: curriculum, daily schedule, long-term plans, etc. If you have any specific questions I’ll do my best to answer or include them in a post if several people are interested. Until next time! I am almost done with mine – great stuff! Eating it with a fork, why not? Homeschool. Cost: about as much as 1 semester of college tuition (when I attended a state school many moons ago). International schools cost $20-25,000 per year PER STUDENT. 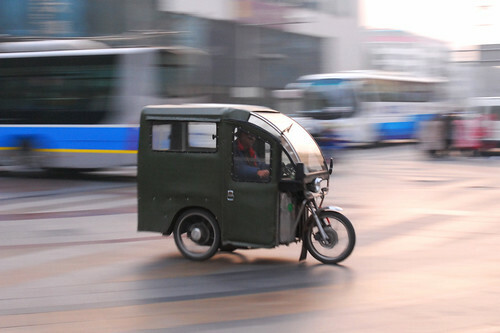 (Roughly 125-155,000 RMB.) In case you couldn’t guess, $100-125,000 per year for school just refused to fit anywhere into our budget. Chinese bilingual schools cost about half that—so $50,000 a year for 5 kids. It’s half the cost, but still outrageous and untouchable. Chinese private schools are roughly half the cost of bilingual schools, about $25,000 per year for all 5 kids. It’s starting to sound pretty good compared to the international schools, but it’s still not doable. Chinese public schools (can you guess?) are about half the cost of private, $2-3,000 per year per student, or $10-12,000 per year for 5 kids. Ok, FINALLY. Something that’s sounding reasonable (…only because we heard the ridiculously expensive tuition of the other schools first!). And the last option is homeschool. We would have to hire a tutor for Chinese (since I am most definitely not qualified to teach that subject). The rest of the curriculum and materials would only cost $1000-$1500 for a year for all 5 kids but…it might also cost me my sanity. Tough choice. 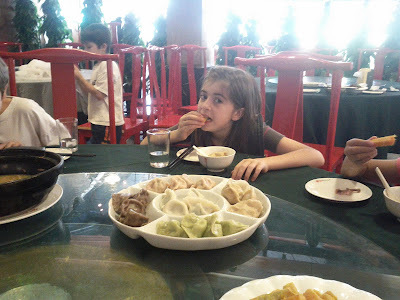 Since we had no idea if we would be accepted into any Chinese public school, I made a backup homeschool plan. I decided that if we did get into Chinese school, I could homeschool in the summer in order to keep the kids caught up with U.S. Curriculum. And if we didn’t, I would have the homeschool curriculum ready to go. So I bit the bullet and did it. After lots of research I made my choice, bought a full homeschool curriculum for the kids for the bargain price of $1200, and had it shipped off to China with the rest of household goods. Just in case. With the help of a Chinese-speaking friend, we enrolled Kaylee, Jasmine, and Trevin in the local Chinese school right next to our home. It took them the better part of a day to get them registered, but they were in! Yea! The only catch was that they would only allow them into 1st grade since students are required to pass a test—in Chinese—to enter into any other grade. Obviously, our kids wouldn’t be able to pass any sort of test in Chinese. So, they accepted our 8, 8, and 6 year old into the same first grade class. (They would not accept Michael, age 10, because they said he was too old for 1st grade. And we agreed.) They let us try it out for 1 month before having to commit for an entire semester. School began at 7:45 and ended at 3:15. It sounded like a long day to me, especially since Chinese school is very academic. 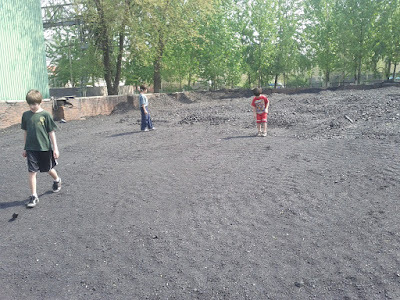 (Recess…what’s that?) And even lunch wouldn’t offer much of a respite, having to speak Chinese, and eat Chinese cafeteria food. I knew it wouldn’t be anything like American schools. Todd and I walked the 3 kids to school that first day, and into their new first grade class. I was nervous for the kids, but I did my best to put on a this-is-so-exciting face for them. We told their new teacher, Mrs. Sun (Sun Laoshi) their Chinese names, since she didn’t speak any English. 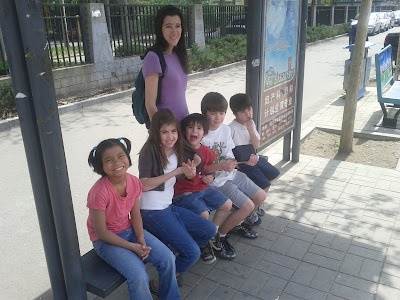 When she introduced our shy, nervous children to the class—in Chinese—I had to fight back tears when my fears almost got the better of me. 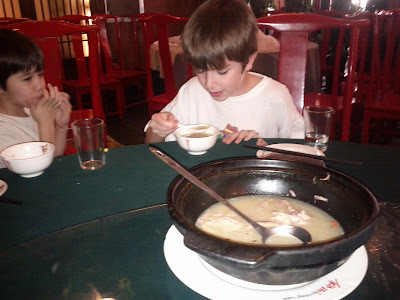 Because at that moment I realized our two English speaking children didn’t even recognize their own Chinese names. Wow. This was going to be rough, and instead of comforting my children, I had to turn and walk out the door, and out of the school. All day I prayed just one silent, fervent prayer: that my children would feel comfortable and not afraid. That afternoon I made the brisk walk to the school to pick up the kids. I was so anxious to find out if/how they survived their first day of Chinese school. To my astonishment and relief, I brought home three smiling, bubbling children! They were so excited to tell me about school. They actually liked it! Hallelujah!!! My prayers were heard, and answered in a big way. Even into the next two weeks, when the new was wearing off, they talked about school and how they especially loved the cafeteria lunches. Ha ha! Chinese cafeteria lunches…who would have guessed. Homework was another story. No one talked about how they liked the homework. Quite the opposite, since it took them hours to complete. We got home from school at 3:45 each day, had a quick snack and started homework by 4:00. They (more like “we”) worked on their Chinese homework until around 6:00, ate dinner, showered, and went to bed. It was a very long day without much of a break. In order to pass to the next grade, the kids would have to test out of the current grade (1st grade). When Jasmine brought her first test home about 3 ½ weeks into school, I saw the writing on the wall. If our fluent, native Mandarin speaker could not pass this small test, what chance did our other two children have with the “big” test? Jasmine had only completed a little more than half of the test, and much of what she had completed was incorrect. They only had a few short months left to learn a good amount of spoken and written Chinese before they would have to take the 1st grade test. I think Jasmine could have done it if we kept working, but I didn’t want her attending Chinese school without any of her siblings. So after 4 weeks we brought all 3 kids home. We have now completed our first month of homeschool…but that’s a whole ‘nuther story. Hopefully coming soon. I thought it might be fun to record my commute to work. From stepping out our apartment front door, to entering the front door at work takes me about 30 minutes. So for all of those curious as to what happens in those 30 minutes, wonder no more Ok, I’m sure no one was wondering – but hey, for those 1 or 2 that are – here you go! 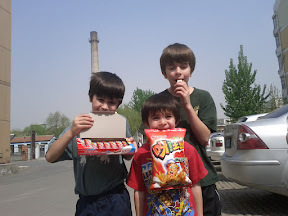 Michael, Trevin and Spencer showing off their snacks with the smoke stack in the background we are about to go explore. On Tuesday, I took the boys out for some good ‘ol boy time. 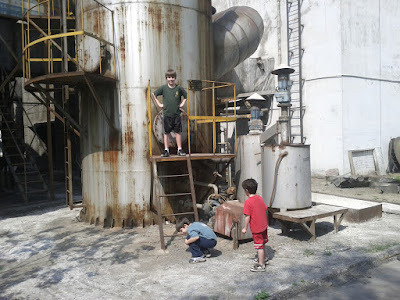 We spent a few hours Tuesday morning walking around and exploring more of the area near our apartment. When we first arrived in our new neighborhood, it was too cold to just wander about for long amounts of time, and this has really been my first chance to just walk around without a specific location planned to visit – doing some good ‘ol exploring with Michael, Trevin, and Spencer! We first walked from our apartment (the yellow house icon in the map below) about a block or two away to the Hualian marketplace (the yellow shopping bag icon in the map) to check it out. I had been there a couple of times myself on some early exploratory missions to see what is close by to our apartment, but this is the first time I had taken any of the kids. I’m sure we’ll come back here in the future, as it has the closest movie theater to our home – and I like watching an occasional movie now and then We looked at the movie offerings they had – and none of them looked quite like something to show three kids, all of them were local Chinese movies – so we opted not to watch a movie. Instead, we went through several of the stores in the market place – actually I’d better describe it as a smaller mall, it is a very nice and clean place – but being clean, it obviously is marketed toward’s a crowd with more than the average income here in China. There is a grocery store in the mall as well – and that is where each of the boys selected a snack of their own that you see in the above photo. We also got some yummy bread snacks at the bakery in the mall – I must admit… I love Chinese bread bakeries and the creative bread creations they make (hrm … I need to write more about Chinese bakeries in a future post). After eating our snacks, we just decided to walk around and see what we could find. The smoke stack we saw near the store (see the first photo above – the smokestack is in the background) looked interesting so we decided to see if we could get a little closer. 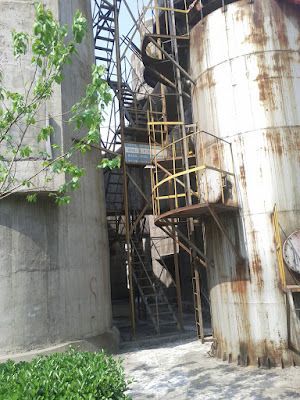 It turned out that the area around the smoke stack itself was easy to get to – and the gate was wide open seemingly inviting us to check it out, so we did Although I wanted to climb up on the smoke stack myself – I figured that might get us into trouble so decided to stop them at the first platform. We took a few photos here thus the camera icon on the map above representing where this location is at. What a temptation ... wouldn't it be fun to climb up? After playing around for a few minutes near the smoke stack – I noticed there were people in one of the buildings there. I went and asked them what this area was, and they told me it had been closed for some time now – which begged the question as to what it was they were doing there. They seemed to be playing mahjong when I interrupted them – so I decided to let them be and we continued on our way. 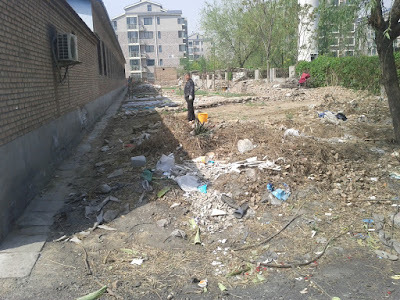 Directly outside of this area I saw this older lady working in the dirt – obviously working on her garden in the small amounts of dirt still available in the outskirts of Beijing. I was interested to learn more myself – so drug the kids over and started to chat. I’m hoping to run into her again, as she was extremely nice and a joy to talk to. She and others in the neighborhood share the small area of dirt there behind the Hualian market area to plant some of their own food. Turns out that she has a son living in the United States as well so was interested to hear we were from the United States. Like so many of her generation that I meet in China, she was all smiles when it came to meeting the kids – and told me how fortunate we are to have them! 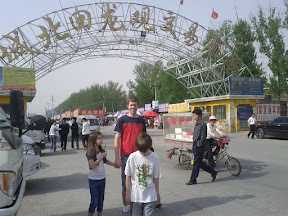 I agree I think the kids even had some fun practicing a bit of Chinese with her – Michael successfully introduced himself, and understood and answered fluently with no hesitation when she asked him his age! I’m impressed by how quickly all of the kids are learning Chinese, they’ll likely pass my abilities in the language before I know it. After leaving I realized I should have asked if we could perhaps come back and help from time to time. I’d love to have a garden again although the walk from our apartment is about 10 to 15 minutes so it is not the most convenient location. 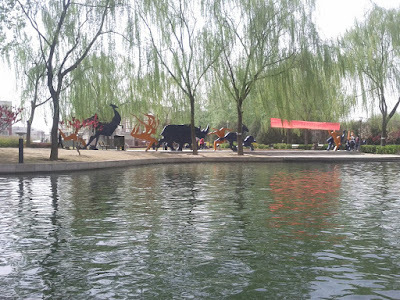 园 (Huilong park). 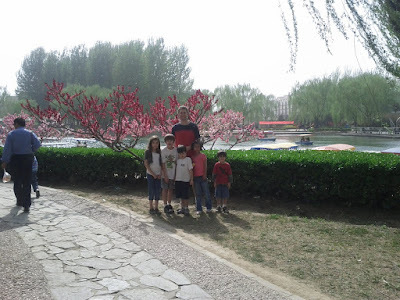 They actually charged admission to the park itself – at 1 yuan per person (~ 15 cents per person), and then within the park itself there were several different places that had things to do that we had to pay for as well – but they all were well worth it, and we all enjoyed them very much. 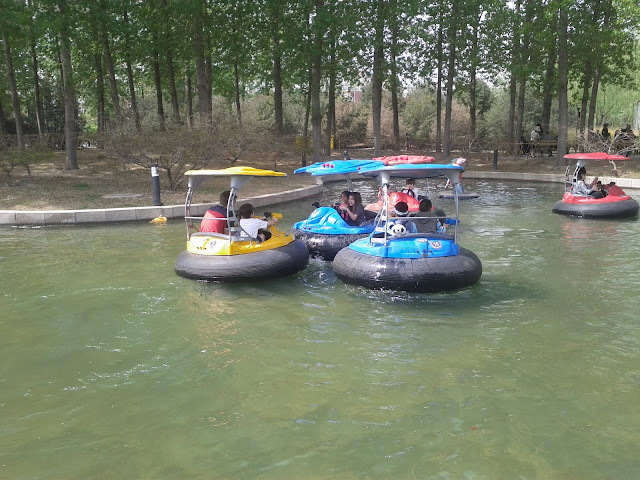 The first activity at the park we decided to do was the bumper boats. 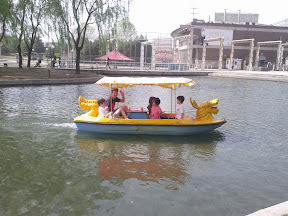 The cost was 30 yuan per boat for a 15 minutes of fun in the water (~ $4.50 per ride, a bit steep I thought, but fun none-the-less). Two of us were able to ride in each boat, the driver on the left, and the gunner on the right. The guns were laser guns – where you could shoot these targets in the water and when you hit them they would start squirting water straight into the air, loads of fun I was paired with Trevin, Michael with Spencer, and the gals Kaylee Ann and Jasmine had the last boat. Jill opted to stay safe and took some great photos and video clips. It was lunch time after we had finished with the bumper boats, so we went in for lunch at a restaurant located just north of the park. The menu was full of sooo many choices, which seems typical from my experiences here so far, fortunately they had lots of photos – as I’m still very uneducated when it comes to all of the names of the various food choices in Chinese (I need to work on that). We opted for some dumplings, a corn dish, an excellent duck soup , and some sweet potato fries The “fries” weren’t called such on the menu, but that’s basically what they were, although the breading on the outside was sweet, while I was expecting salty… unfortunately that turned me off on the fries. The kids loved them though and devoured them down almost instantly! We got two plates of the dumplings, a great variety of flavor and color! Man was this soup good! Would definitely recommend it. 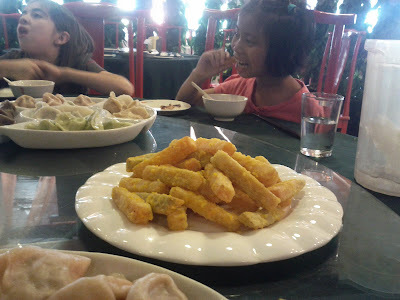 I was expecting salted "fries" when I ordered these, but they were sweet all around... kids loved them! 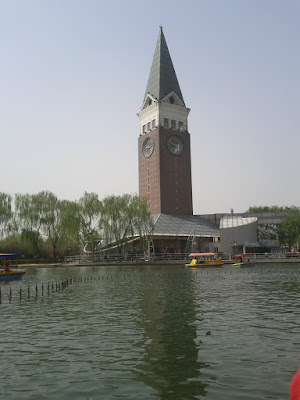 A cool clock tower in the park as seen from our boat. There were many other things to do at the park, which is great – as we’ll have many opportunities to return I’m sure. 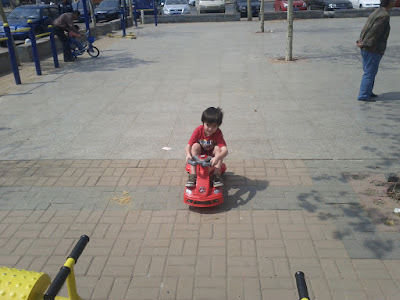 They had several small kiddie amusement rides there, as well as a really fun looking blow up slide (a huge blow up slide – sorry, didn’t take a photo this time), and even some electric kiddie cars you could rent for the smaller kids. I’m sure there are other things I’m missing, but all-in-all a fun place to visit. At the entrance to the exchange market.